Install SQL Server 2017 PowerShell script – download it here | just another windows noob ? In case you missed it I wrote a PowerShell script to install SQL Server 2017 CU5 here. 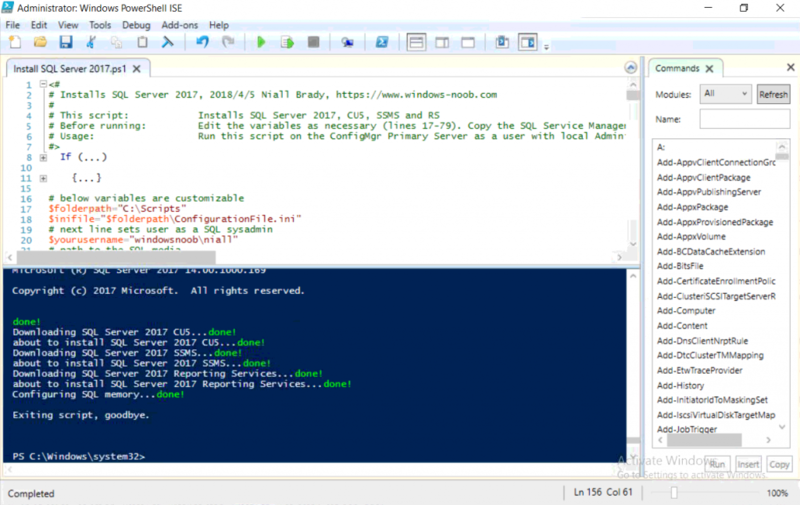 You can install SQL Server 2017 with SSMS and Reporting Services using this PowerShell script. The original blog post was created to help install SCCM 1802 (Current Branch) but I want to draw attention to the PowerShell script included which helps you to automate the installation of SQL Server 2017. To install SQL Server 2017 use the Install SQL Server 2017.ps1 script. The script will create a ConfigurationFile.ini used to automate the installation of SQL Server 2017, and after it’s installed the script will download the SSMS executable (Management Studio) and install it. Then it will download Reporting Services and install it. If either of the EXE’s are in the download folder, it will skip the download and just install. SQL Server no longer comes with the Management Studio or Reporting Services built in, and they are offered as separate downloads, don’t worry though, my PowerShell script takes care of that for you. You can download the PowerShell script to install SQL Server 2017 CU5 here. This entry was posted in PowerShell, SQL Server 2017. Bookmark the permalink.